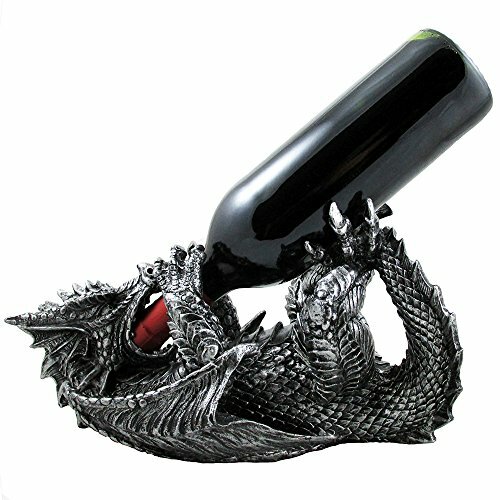 Decorate the bar in your castle with a mythical dragon wine bottle holder that is designed to impress! With a pewter look finish, this intricately detailed medieval statue just bristles with menace from his fearsome horns to his barbed tail, and every silvery scale in-between. Certain to be a conversation piece at your next party, this impressive sculpture that doubles as a tabletop wine rack, adds a magical air anywhere you choose to display it. Makes a great Christmas gift idea for that wine enthusiast or collector of fantasy and medieval décor. Decorate the bar in your castle with a mythical dragon wine bottle holder that is designed to impress! - See full description below. Dimensions: 12 1/4" x 6 1/2" x 6 7/8" high. Weight: 3.1 lbs.